It's a forgotten fixture that provides a quiet aesthetic in your kitchen. It's also where the hardest stains tend to end up. The backsplash gets the bulk of splatters and sprays from the myriad dishes prepared in the kitchen. You may also end up with greasy grout on your countertops and floors. Cleaning kitchen tiles of grease and getting the stains out of the surrounding grout doesn't take long if you use the right cleaners and pair them with the best techniques. 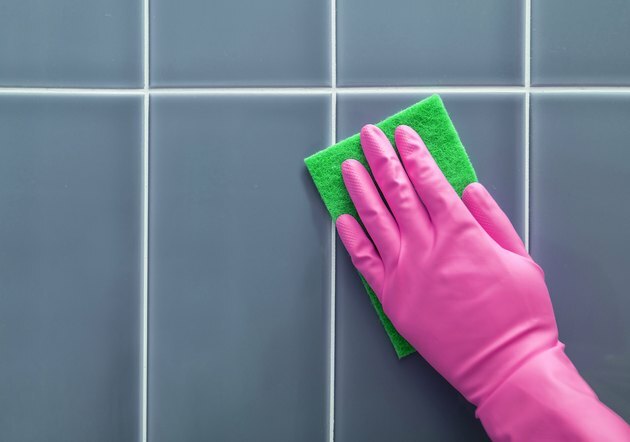 Whether you plan to use a homemade cleaner or a commercial cleaner, wearing a pair of gloves is ideal for getting into the nooks and crannies of tile and grout in the kitchen. The bits of food and cleaners can get under fingernails and irritate skin as you scrub away. You'll also want to have at the ready a toothbrush for stubborn stains in tiny grout grooves, a soft-sided scrubber sponge for ceramic and glass tile and a nylon scrubbing brush for getting at clumps of batter, sauce or marinades that have clung to the countertop or backsplash. Have a stack of clean towels for wiping up extra liquid and buffing away the residue from soaps and detergents to make the workspace shine. There are many degreaser cleaners on the market, and many smell like orange or lemon. The citrus action in the commercial detergents is what makes it a hardworking cleaner. You can make it at home with fresh lemons, baking soda and vinegar. Combine one part lemon juice and one part vinegar. Add two parts baking soda to the mixture and stir to make a paste. Spread the paste over the grout and tile. Make sure it has good contact with the hardest hit grease areas. A soda glass backsplash may get filmy during this process but won't be harmed by the gentle grease remover. Simply buff out the glass until its former shine returns. When globs of grease attach to the backsplash of the stove or countertop, use a few tricks and specialized commercial cleaners to erase it from the tile grout. A few stellar choices that are eco-friendly and nontoxic include Mrs. Meyer's Clean Day Cream Cleaner. It cuts through the tough grime on stovetops and countertops that can collect over time and be harder to remove. Tech Grout Cleaner is a little more serious and is sold at most home improvement stores. It's what professionals try for tough jobs. It's nonacidic, odorless and 100 percent biodegradable. How Does Goo Gone Work?